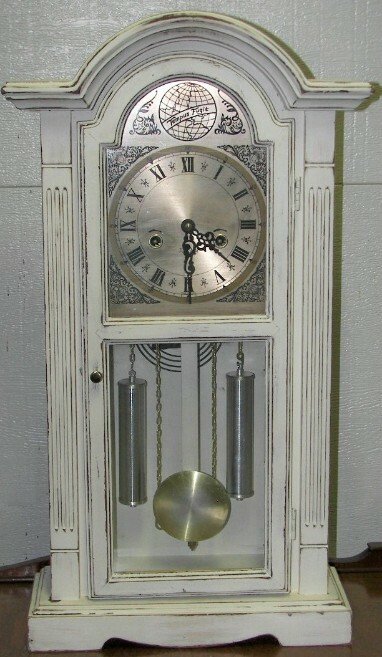 Scrumptious Westminster Chime Cabinet Clock refinished in Parisian White and gently distressed to highlight all the pretty curves and details. This is a tall mantle or wall clock which features a 31-day key (included) wound Westminster chiming movement. Chimes on the half and whole hours. 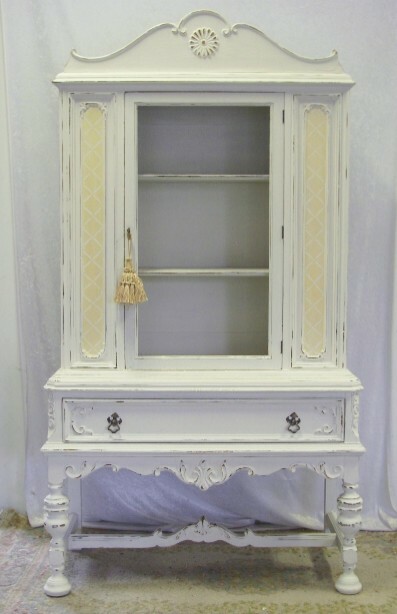 Truly scrumptious french country cabinet in a beautiful butter color with white trim. Features an upper glass front with 3 shelves and lower storage with 2 shelves. Brass hinges and hardware and hand-painted fleur des lis on the lower cabinet. Eastlake Settee circa 1880. 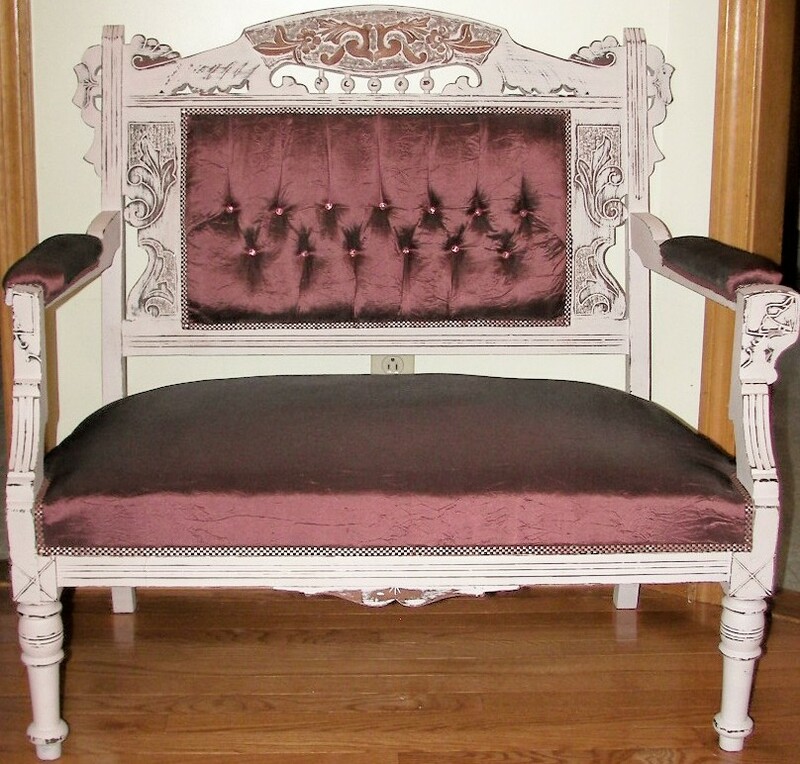 Refinished in Blush with a gorgeous Chocolate iridescent Silk Dupioni upholstery, chocolate & blush checker trim and copper tacks. Petite pink crystal ball buttons peek out of her tufts (all done by hand!). 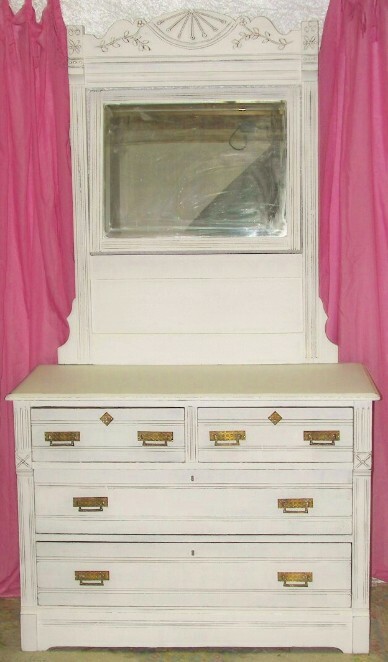 Truly scrumptious antique Eastlake dresser has original hardware and escutcheons! Locks on drawers still work with solid locks. Original mirror in great condition and even tilts. The spoon carvings and details on this are spectacular! 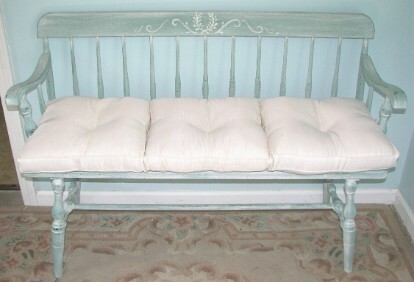 Measures 7' x 45"x 18"
Truly SCRUMPTIOUS Cottage Bench reDesigned in Verdigris with a lime wash and handpainted detail on the back. Such a versatile piece that could be used in a mudroom, a front porch, in an entry hall, at the foot of your bed or even at a kitchen table as seating! The possibilities are utterly endless so get creative. Measures 37" wide x 36" tall x 22" deep. TRULY scrumptious Victorian Vanity! 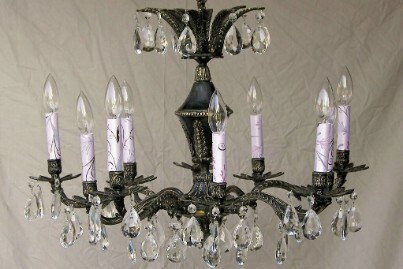 Features the quality workmanship of the Victorian era. ReDesigned in Butter Cream with a lime wash and hand-waxed finish. 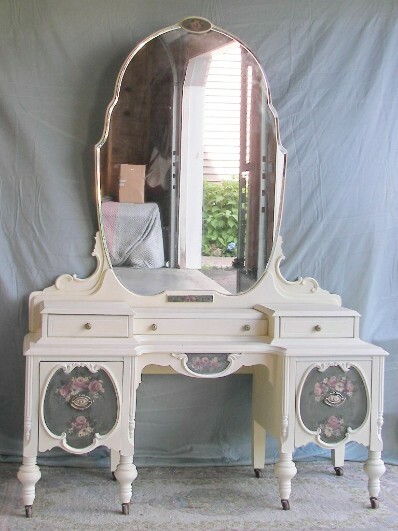 Retains the original hardware, wheels, mirror and beautiful handpainted floral sprays on drawer fronts and mirror accents. The floral sprays are pink and butter on a sage background. Simply stunning and perfect for your boudoir! Measures 67" tall x 48" long x 18" deep. 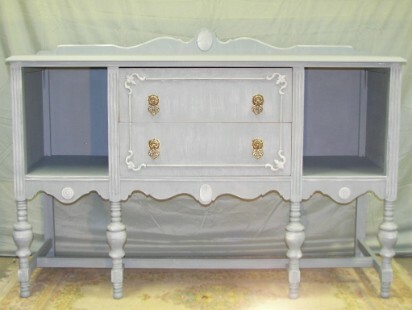 Truly Scrumptious sideboard has been refinished in a French Blue and given a lime wash for an oh-so-french redesign. Though it was originally a sideboard, this would make a SPECTACULAR changing table in a nursery. There is open storage on both sides for stashing diapers, blankets, powder and wipes with deep drawers for storing pajamas and what nots. OR..the possibilities are endless with this piece. Of course you could use this as originally intended - as a sideboard with beautiful display areas to the side. Or as a beautiful TV stand in a living room. I even see it as a beautiful console in a mudroom (and stash the mittens and hats in the drawers! Let your imagination run wild with this one because it's that kind of jaw dropping piece. Gorgeous and demure describes this SCRUMPTIOUS Chippendale dresser with rope detail, ball-claw feet and lattice relief. 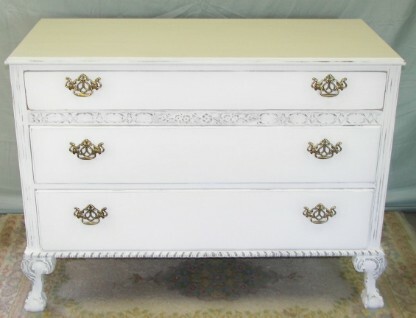 It has been refinished in French Blanc ( a true white), accented in silver leaf and finished in beeswax. It's simple, elegant and feminine. Can be used a a dresser, console or even a fab stand for your television. The possibilities are endless with a versatile piece like this. Absolutely spectacular! Refinished in black and gently distressed to reveal it's original gold finish. Loads of crystal and custom bulb sheaths that feature a gorgeous flocked paper in blush and black. Has modern wiring and is ready to hang! Duncan Phyfe pedestal drum table with antique French Lace and Franciscan china mosaic in the Desert Rose pattern. 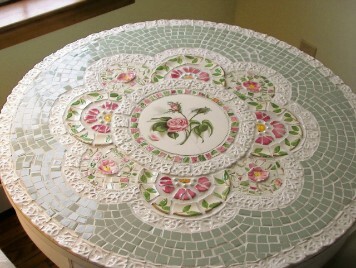 This table features beautiful shades of pink, green, cream and just a touch of yellow. Literally jaw dropping and is never short on compliments. It took me 6 months to create this one-of-a-kind table that is guaranteed to have your guests tongues wagging. Striking as an entry hall table, side table OR - find 2 fab chairs and convert it into a Bistro set! Truly a scrumptious antique! 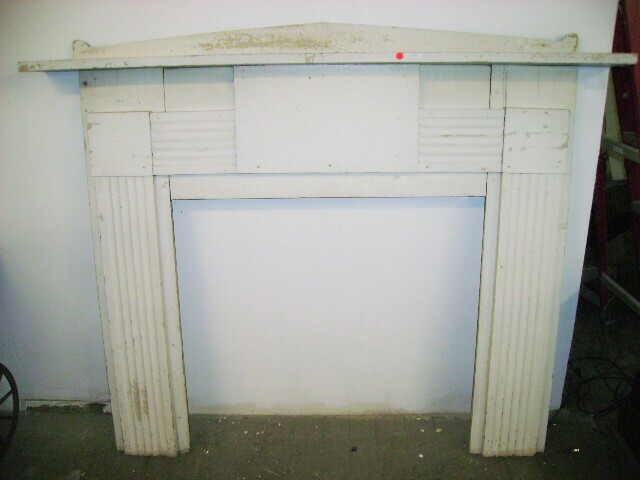 This mantle was removed from a home in Hubbardston, MA built circa 1870. 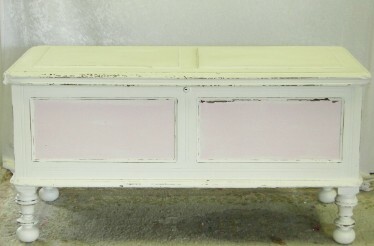 The mantle has hand-hewn nails even and a chippy white finish which is completely original. Comes in 2 pieces; surround and gallery. Measures 65"x49" outside with a 33"x36" opening. Scrumptious faux brick fireplace is circa 1960's and unbelievably lightweight since it's actually made of fiberglass but you'd NEVER know! 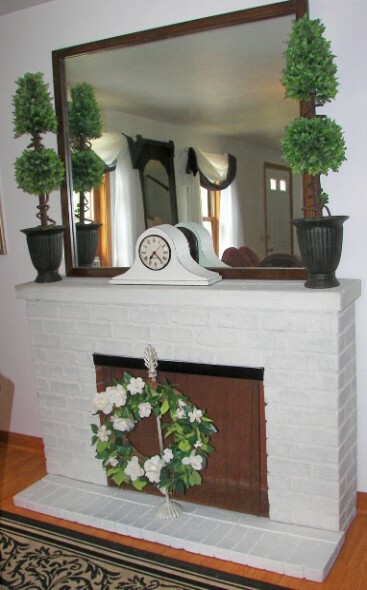 Every single person who has seen this fireplace, has believed it was REAL. Includes electric logs which cast a beautiful glow at night. No modification would be need to use this with fireplace sterno instead. Features mesh pull screen that true fireplaces posses to stop ashes from flying. Refinished in white with fire cabin in original brick finish. Comes in 2 pieces; I defy you to find another one like it! Measures 60" x 40" x 12"